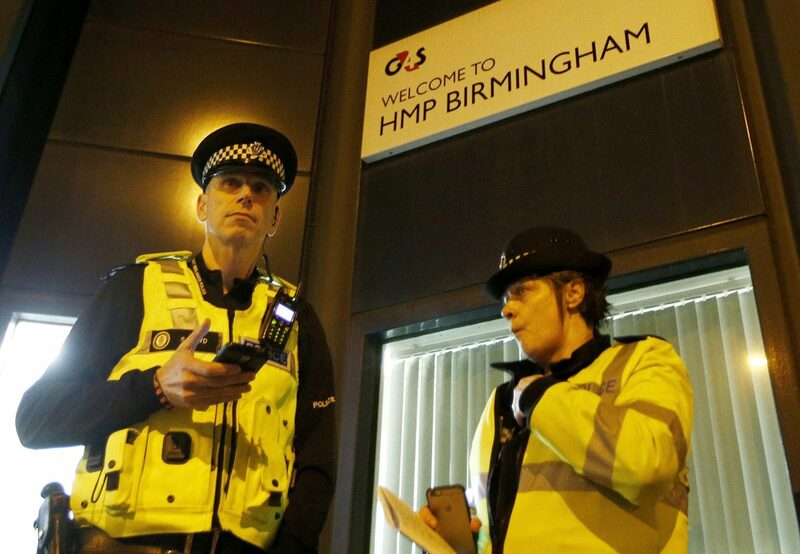 Police officers stand outside Winson Green prison, run by security firm G4S, after a serious disturbance broke out, in Birmingham, Britain, December 16, 2016. Garda World on April 10 said it was considering making an offer for all or part of London-listed security company G4S, confirming a report in the Evening Standard which valued a potential bid for the company at 3 billion pounds. Under British takeover rules, the privately owned Canadian company has until 1600 GMT on May 8 to make an offer. G4S shares soared 20 percent to 221 pence on April 10. They were broadly flat by 0800 GMT on April 11. G4S said there was no certainty Garda World would make an offer for the company, and urged shareholders to take no action. The company said the process of separating its cash management and transportation business, which brought in 15 percent of revenue last year, would commence in the second half of 2019. It has received expressions of interest in all or part of the business. The bulk of G4S revenue comes from security services such as risk consulting and technology-enabled monitoring and response. The company says 7 percent comes from care and justice services, including running prisons and transporting prisoners.